After 58 years of ownership by the Breidel family, La Crosse’s last meat market has a new owner – Lee Tabbert — and a new name — Bubba’s Meats. Bubba’s opened Nov. 1 in the former Breidel’s Meat Market at 1248 Redfield St.
Dave Breidel, who is about to turn 66, wanted to retire from the business that his father, Leonard Breidel, started in 1955 at another La Crosse location. Since Breidel began easing into retirement in December 2007, the market has been open only from November through March, mainly to process deboned venison for deer hunters. But during those months, Breidel also continued to make and sell retail products with other types of meats because of demand from longtime customers. “That wasn’t my original plan,” he said. Breidel will totally retire after spending the next few weeks helping Tabbert. Bubba is a family nickname for the new owner’s 14-year-old daughter, Kaylee Tabbert, who will help him part time. As a baby “I used to call my pacifier Bubba,” Kaylee explained, smiling. Bubba’s Meats will be open at least until May and then will close for remodeling before reopening next November. Tabbert said the market might eventually be open year-round but for now probably will be open from November to May. Tabbert’s mother, Leona Rahn, and her husband, Dave Rahn, are retired and also will help part time at the meat market. Using Breidel’s recipes, Tabbert will continue to make the market’s signature products, such as hot dogs, ring bologna, turkey and beef jerky, summer sausage, snack sticks, braunschweiger, breakfast sausage and bacon. The market also sells hamburger. And Tabbert will process deboned venison for deer hunters. Breidel said he is glad that his family’s recipes will continue to be used. He had worked at the meat market part time since high school. When he bought out his father in 1972, Breidel quit his full-time job at Trane Co. and began working full time at the market. 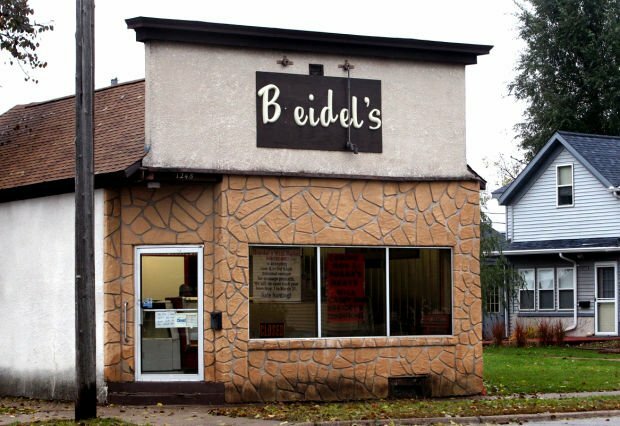 Breidel’s Meat Market began at 1204 West Ave., and Dave Breidel moved it in 1973 to its current location — which has housed a meat market since 1890. There were at least 10 meat markets in La Crosse when he started working at his family’s business, Breidel said. “Anytime you have your own business it’s a lot of work and it’s a lot of hours,” he said, explaining why new owners didn’t come forward when the old ones retired. Tabbert and Breidel had known each for many years through trap-shooting events. For the past two to three years, they’d talked about Tabbert possibly buying the meat market. Tabbert owned a drywall company for the past two years, after working at three area screen-printing companies for nearly 30 years. “I didn’t want to see it go away” when Breidel retired, Tabbert said of his decision to buy the market. Tabbert, 48, said he has enjoyed making his own sausage products at home for several years. WHAT: A meat market that opened Nov. 1 in the former Breidel’s Meat Market. Yeah! This is great news. So happy to hear that they will be using the Breidel/Schubert recipes! Best bologna and wieners ever! Great news I love local meat markets, the taste is so much better. I will be coming over soon to try your great Hot Dogs. This is great news. La Crosse in the past had many such wonderful meat markets. It is great news this business is making an ownership and generational leap to continue on.